PHOTO: Allen Ramsey, DWCPhoto.com. Highlands junior running back Grant Murray (24) sprints toward the end zone in the third quarter of Friday's game against Woodford County. Highlands won 50-14. Yellow Jackets may have stingers, but it was the Highlands Bluebirds football team doing most of the stinging Friday at David Cecil Memorial Stadium. Highlands (6-5) dominated the trenches early and often against Woodford County (3-8) and its three NCAA Division I senior linemen in University of Kentucky commit Drake Jackson, Western Kentucky University commit Seth Joest and Saige Young, who has offers from Ball State and Troy University. Highlands outgained Woodford County, 389-162 in total offense on its way to what has become a typical 50-14 first-round thrashing. "It's about everything we've been doing," said Shelby Jones, Highlands Defensive Coordinator. "The guys have been getting after it. They've been buying in all season. We're just trying to get better every single play. They're having a lot of fun out there. That's all you can ask for now." The Bluebird offensive linemen opened the holes up front for the running backs. 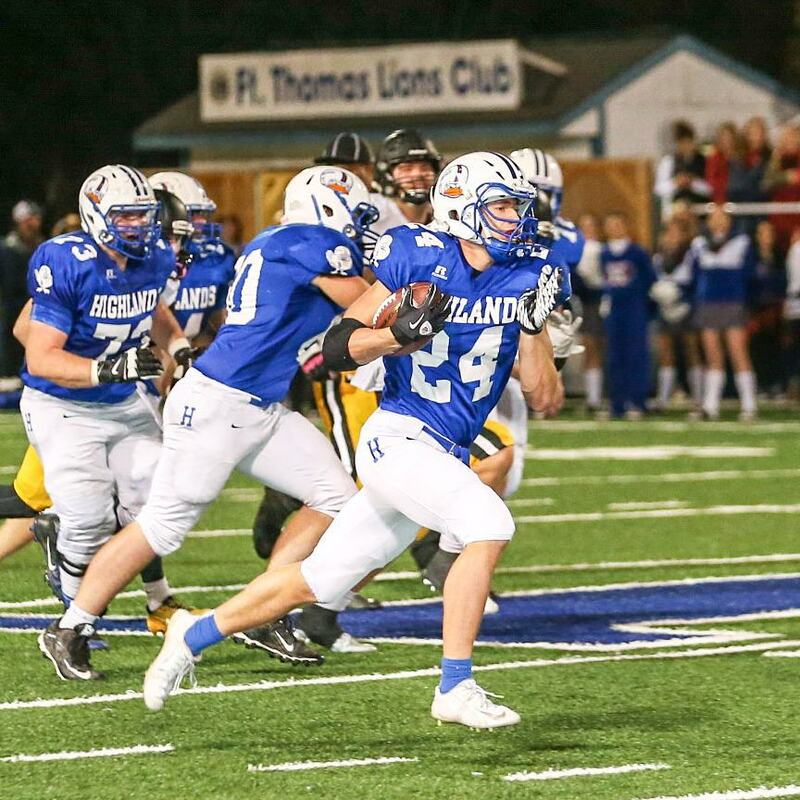 Once at the second level, the Bluebird running backs often swung past defenders then hit full steam ahead going toward paydirt. They gained 300 yards on 31 carries. Senior Nick Kendall once again led the Bluebirds with 14 carries for 122 yards and four touchdowns in their spread offense against Woodford County's 3-4 defense. Junior Jared Pulsfort followed with eight carries for 91 yards and Grant Murray had 85 yards rushing on four carries and two touchdowns. "The offensive line played great," Murray said. "They opened up holes all day and made it easier for the running backs to get the yards. You have to give them time to get the blocks and follow them." Highlands led 22-0 after the first quarter and hit the running clock with 8:36 left in the second quarter with a 36-0 advantage. This marked the second time the Bluebirds hit the running clock on an opponent. Highlands also had 12 first downs to eight for Woodford County. "We played well," said Brian Weinrich, Highlands Head Coach. "We had a great week of practice. Even with the stuff we did before the game, I don't know if it was a sense of urgency or a sense of excitement, but they practiced fast. That stuff transfers to games. We did exactly what we wanted to do, executed and let the game take care of itself." The Bluebirds did not have to pass much. But senior quarterback Austin Hergott hit 4-of-9 passes for 89 yards. Sophomore Griffin Huber led the Bluebirds with three receptions for 66 yards. Early on, Woodford County tried to run between the tackles with Emir Bernabe and DeVontre Winkfield out of the I-formation set against the 3-4 Highlands defense. Bernabe finished with 14 carries for 77 yards. "We just really tried to get our jobs done," said Trey Bowden, Highlands junior linebacker. "Even though they had Drake Jackson, one of the best linemen in the nation, it didn't really seem to affect us. We gave it our all. Winning five games in a row is awesome. That's what you want, especially going into the playoffs." But once the Bluebirds built a nice lead, the Yellow Jackets went to a shotgun spread set and struggled throwing the ball. Senior quarterback Trey Thurman made a few nice runs on quarterback sweeps and draws. But he only completed 3-of-16 passes for 53 yards to go with two interceptions to Highlands defensive backs Bradley Greene and Austin Beal against consistent pressure all game. The Bluebirds held the Yellow Jackets to a three-and-out on their first possession before taking the ball and moving downfield quick. Kendall scored from a yard out to put Highlands up 7-0 with 8:32 left in the first. Highlands started its next possession at its own 46. Kendall hit the gap turned inside and broke free for a 28-yard touchdown run. That gave the Bluebirds a 14-0 advantage with 5:37 left in the first quarter. Woodford County did move the ball some on its next possession. But on 4th-and-8 at the Highlands 40, Thurman tried to run for the first down but Trey Bowden stopped him at the line of scrimmage to give the Bluebirds the ball back. The Bluebirds again moved downfield quickly. Kendall scored from 15 yards out before taking a pitch from Hergott on the two-point conversion and throwing to Eric Miller to give Highlands a 22-0 lead with 1:41 left in the first quarter. "It was interesting," Weinrich said. "We didn't know what to expect early on. We had so much coming into this game. They had such as diverse group of guys. They had ginormous guys then they had the quicker guys. They would mix and match them. We were trying to figure out if we go inside or outside. The guys did a great job. We throw a lot at them because of what (Woodford County) did on defense. They really handled it well." Greene recorded an interception with 31.4 seconds left in the quarter to set Highlands up at the Woodford County 41. Murray scored from a yard out to put the Bluebirds up 29-0 just 57 seconds left into the second quarter. Hergott set up the score with a nice pass to Mitch Cain to the Yellow Jacket 1. Highlands again started its next possession in Yellow Jacket territory. It took one play for Hergott to throw a 33-yard touchdown pass to Huber and give Highlands a 36-0 advantage with 8:36 left in the half. The Yellow Jackets did score on the ensuing kickoff. Dwayne Depp returned it 99 yards for a touchdown but the kick bounced off the left post to cut the Bluebird lead to 36-6. That was the halftime score. It did not take Highlands long to score in the third quarter. With 9:25 left in the period, Murray broke free for a 61-yard touchdown run to put the Bluebirds up 43-6. Woodford County did score with 5:09 left in the quarter. Thurman ran around the right side for the touchdown and Domynik Johnson ran in the two-point conversion to make it 43-14 Bluebirds. "We pretty much controlled everything," Jones said. "We got to play a lot of guys. The more guys we can get out there and do what they're supposed to do. It doesn't matter who they are. If they do what they're supposed to do, we'll be in good shape." The last Highlands score came with 8:04 left in the fourth quarter. Pulsfort broke off a long run before Kendall scored from five yards out to make the final score. One thing Highlands hopes to correct is turnovers. The Bluebirds lost two fumbles. One came deep in Yellow Jacket territory and the other happened on its side of the 50-yard line late in the first half. But Beal's interception prevented Woodford County from scoring any points off it. "A little bit of it was on (Woodford County)," Weinrich said. "They were getting after it a little bit and we rushed some of our exchanges. That's one of those fundamentals we practice every day. That could be a problem if it was a close game." Highlands takes on Dixie Heights (3-8) in a rematch of the regular season. Game time is 7:30 p.m. Friday at David Cecil Memorial Stadium.